Hello Everyone, My name is K S Lokesh. Iam a doctor. I have finished MBBS recently. At present I am 25 yr old. I am tall and slim person. I like making friends. I live in Nanjangud. Its my home town. I had my primary education in Nanjangud itself. Visit www.Nanjangud.Info to know about my home town Nanjangud. 1st to 7th Standard - Carmel English School, Nanjangud. 8th to 10th Std - Marimallappa's High School, Mysore. MBBS - JSS Medical College, Myaore. 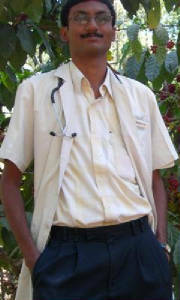 Iam a fresh doctor.. not in a permanant job yet.. Iam also in touch with computers and programer by hobby.